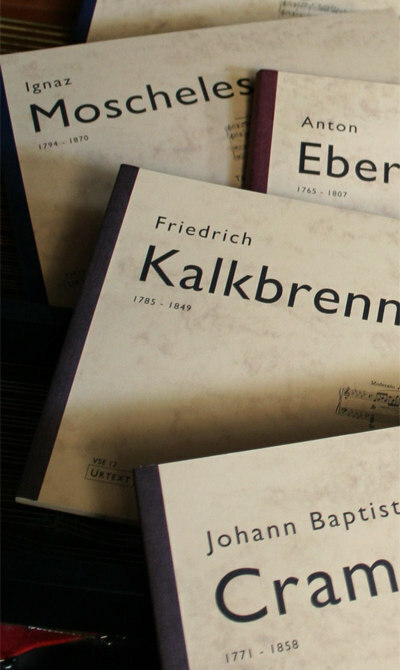 Van Sambeek Edities is a small publishing firm of sheet music which has recently produced four interesting editions. The music comes from the late classical and romantic periods and is not available in any form other than in original editions. Different from other publishers of similar works, Van Sambeek chose not to produce facsimiles; the pieces have been meticulously set anew in a modern lay-out. The books are in oblong format (A4 landscape) and have a plastic spiral binding. The quality of both the type-setting and the off-white (cream coloured) paper is outstanding. Unfortunately the critic did not have the original, nineteenth century editions of these pieces at his disposal, which made it impossible to judge whether the type-setting is textually accurate . However,the care given to the edition gives one the impression that the work has been done with apt precision – as does playing the pieces through at the keyboard. The German composer August Eberhard Müller (1767-1817) wrote in a basically classical style, which vaguely reminds one of Beethoven. Of his works, the “Caprice” opus 4 and the “Grande Sonate” opus 36 were published in one volume. Johann Baptist Cramer (known through his Etudes) composed his music in a similar style, perhaps a little more romantic and certainly pianistically more virtuosic. Van Sambeek Edities have published his “Three Sonatas“ opus 23. The music is attractive and well-written and it works particularly well when played on an English (square) piano from around 1820, as the critic personally noted. Another composer mainly known for his Studies, and consequently seriously underestimated, is Carl Czerny. His “Grande Fantaisie en forme de Sonate” opus 144 is a large-scale work which certainly merits attention. Finally Van Sambeek’s fourth publication contains two concert paraphrases by Sigismund Thalberg on Mozart’s “Don Giovanni”. Every piano connoisseur has probably heard of the competition between Liszt and Thalberg, but hardly anyone is familiar with music by the latter composer. This edition offers the opportunity to compairThalberg’s Don Juan transcription with Liszt’s paraphrase which cannot be praised highly enough.